Older homes can be stunningly beautiful. They have a character and charm all their own. The glamour of bygone days can be brought out in your older home in ways that will make guests wish it was their own home. 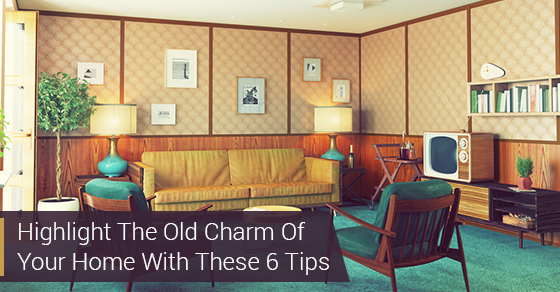 If you’re one of the people lucky enough to live in a home or an apartment with old school charm, you might want to consider these tips to bring out the best in your vintage surroundings. Although an older home can be quaint, quirky and charming, let’s face it—it’s old, and with age can come some imperfections. Many of the added touches in older homes are what give it that stately air—things like trim, mouldings and fixtures. A fresh paint job is the first way you can love your space. By painting everything one colour, you will be able to mask any imperfections and highlight those marvellous details. A lighter shade on the walls and a slightly darker one on the doors will make a room pop. If the trim is in good condition, then show it off by painting it a neutral shade, one that contrasts with the walls. For instance, match blue walls and gray trim. Applying the same colour as the trim to the ceiling will give the room a very stately appeal. Some older homes bear the mark of glorious stained glass. Some of these windows are art pieces in themselves, and they should be highlighted as such in your home. Shades that are flush to the window moulding or recessed are better at highlighting lovely, old trim. A little modern touch to go with your vintage features makes a pretty good statement. By using shelving that is open, the architecture can be seen. Open shelving units, or as the tres chic French refer to them—étagères—are great for showing off collections of books and knick-knacks. They make the room feel like a gallery. Add accessories that look like they’ve withstood the test of time. They will fit right in with the aged flair of your home. This look suits a sage, old house well.